For many years, the OEM fix for major cracking or shell distortion was replacement of the defective shell, also referred to as casing by some OEMs, with new. 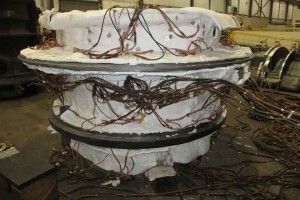 Mechanical Dynamics and Analysis has provided an alternative to shell replacements which includes fixing the existing shell to extend its life. MD&A recently welded and repaired the HPIP outer shell, HP & IP inner shells, and nozzle box on a 677MW large steam unit. 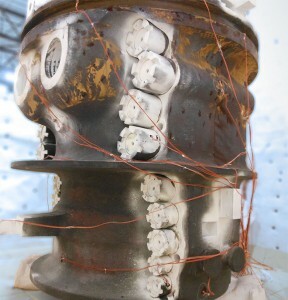 Inspections revealed axial distortion and mechanical damage of the critical positional fits on the outer shell, inner shells, and nozzle box that was caused by galling during an overhaul disassembly, and out-of-roundness of the HP and IP inner shells due to operational thermal stresses. With over 30 years of experience, MD&A has the technical expertise in the power industry to repair your turbine. Our philosophy involves intelligent, technically sound and proven repair options. The HPIP outer shell upper half galling damage on the axial positional fits to the inner shells were weld repaired on-site. The repair involved weld preparation, NDE, preheating, welding, heat treatment, final machining, runout checks, dimensional checks, and final NDE and hardness checks. Due to the welding and machining operations performed on the outer shell to repair the damage to the axial fit face surfaces, this slightly changed the axial position of the sealing face and reduced the overall width of the tongue for the tongue and groove fit in the outer shell. In order to restore the correct axial position of both the HP and IP inner shells within the outer shell, and to ensure the tongue and groove fits had the correct designed clearances, the entire 360° seal faces and clearance faces of the HP and IP inner shell fits were weld restored and machined. Weld repairs and a full stress relief re-rounding operation of the HP and IP inner shells was performed by MD&A’s experts in St. Louis Turbine-Generator Repair shop. The HP and IP inner shells were re-rounded to within 0.036” of original design diameters after the stress relief re-rounding operation was completed. Also, due to the amount of as-found horizontal joint gaps and diameter out of roundness with all studs tensioned, it was decided to perform horizontal joint welding and heat treatment of both the HP and IP inner shells. 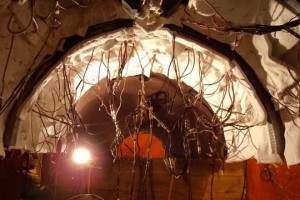 The repair process involved weld preparation, NDE, preheating, welding, heat treatment, final machining, and checks. The upper half nozzle box damage was weld repaired, the snout ring bores were honed, and new snout rings were installed. The raised material and galling damage on the axial fits of the nozzle box were ground out and the fits were prepped for welding. 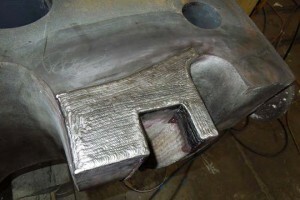 The areas were preheated, welded, and locally post weld heat treated. A GTAW welding process was used for this operation. Once the work was completed, a final NDE inspection was performed on the welded and dressed areas and no indications were noted. Because of our vast knowledge and experience with different types of OEMs, MD&A experts are capable of performing any welding repairs. We are your full-service turbine-generator service provider. No matter what the problem, MD&A’s experts have the solution! Have MD&A look at your casings / shells today, call our Turbine-Generator Repair Facility at (314) 880-3000 or use our Contact form.